Set sail to the newest tablet of Cherry Mobile. The CM Superion Voyager has great specs to offer, the 3G support, call function, text function, and of course a larger 8-inch display. The specs is on an entry level tablet, the processor is just 1GHz dual core, 512MB of RAM, 4GB of internar storage which only 2GB+ is usable. Behind there is a Jelly Bean 4.2 OS, not the latest version but best for such tablets. A common attitude towards tablets is (tablet = entertainment) with Cherry Mobile Superion Voyager, you'll get more than entertainment, but also enhance usability. Complete specs after the break. 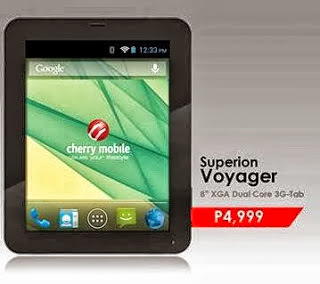 CM Voyager is priced at Php4,999.00 SRP, available next week nationwide.